Get on board our catamaran sailing adventure, you will enjoy a great reef snorkeling adventure on the world's second-largest barrier reef - the Great Mayan Reef. Located inside Puerto Morelos protected marine preserve, you'll be amazed by all the colorful fish and marine life surrounding the coral reefs. The tour starts with a sailing trip on the Mayan Riviera, from deck you will see some of the most beautiful beaches in the Riviera Maya, we will reach some of the most dazzling coral reefs to snorkel, and if you want you can enjoy lunch at a marina-view waterside restaurant. During the tour you can enjoy drinks from the all-you-can-drink open bar as you enjoy a great sunny deck whike we sail over the clear blue waters of the Caribbean Sea. Enjoy Great snorkeling in Puerto Morelos National Marine Park with amazing coral reefs! Relax and enjoy some drinks from the all-you-can-drink open bar. When: Twice Daily at 9:00 AM and 2:00 PM. 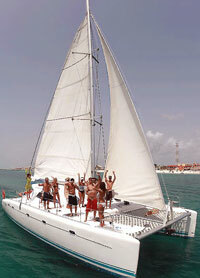 Where: Puerto Morelos, about 20 minutes from downtown Playa del Carmen. Exact meeting instructions will accompany your confirmation. How Long: 4 Hours Approximately (Add 1 Hour if Having Lunch). Optional: Add a 3-Course Lunch and 2 Drinks with Lunch for only $10.00 $9.50 Per Person!